Hardcover, 9.5 x 11.25 in. / 302 pgs / 107 color. 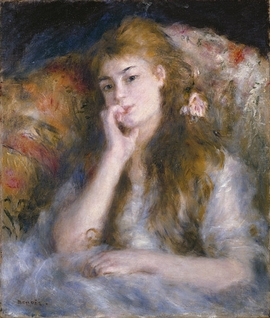 Renoir’s early years at the forefront of Impressionism. Text by Augustin de Butler, Peter Kropmanns, Marc Le Coeur, Stefanie Manthey, Sylvie Patry, David Pullins, Nina Zimmer, Michael F. Zimmermann. Alongside Monet, Bazille and Sisley, Pierre-Auguste Renoir laid the foundations of Impressionism in 1860s Paris. But acclaim for his painting was slow in coming, primarily because of the tribulations of the Franco-Prussian War and the Paris Commune, which put a hiatus on so much artistic activity during the 1860s–70s. As a result, the first two decades of Renoir’s career are sometimes ignored, an oversight this superb volume decisively remedies. The artist’s most important model during these years was his mistress, Lise Tréhot, with whom he was involved from 1865 to 1872. His depictions of Tréhot, in classic paintings such as “Woman in a Garden” and “En été” (both 1868), underscore the importance of Manet for the Impressionists in general, but also show Renoir infusing the older artist’s somber palette with the warm, burnished glow for which he is beloved today, and exploring the looser handling of the brush so closely associated with the Impressionist movement. This volume also looks at Renoir’s plein air landscape paintings and other portraits, such as those of his fellow Impressionists Frédéric Bazille and Claude Monet, altogether reproducing 250 works in full color. Revelatory and comprehensive, Between Bohemia and Bourgeoisie is the first extensive examination of the painter’s early oeuvre and the importance of his close friendships with Bazille, Manet, Monet and Sisley. 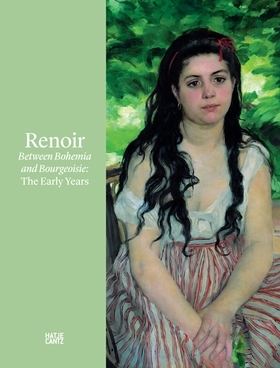 Featured image is reproduced from Renoir: Between Bohemia and Bourgeoisie. Gone is the innocent secessionist dream of the "painters of modern life," the programmatic heroism of the refusés who rejected the recognition that came with exhibiting work in the Salon. Nor is our image or Renoir any longer the rosy one of artistic legend. His biography has become more contradictory, undermined by episodes long left unmentioned…the Kunstmuseum Basel [exhibition]… shows Renoir's work before his "Arcadian turn," that is, from the years before his social and commercial success…At the Basel show one wanders back and forth between the works of an ambitious and talented young painter still getting his footing in the vibrant Paris art scene between 1864 and 1879. He looks back to Narcisse Diaz, is impressed by Courbet, and has before his mind's eye the works of his friend Manet, the true initiator of Impressionism…After immersing itself in mythology, the painting of modern life seeks a new location for woman…But what in Manet is the result of deep reflection on art history, in Renoir springs from a desire for naïve sensuality…In a poetic passage in In Search of Lost Time, Proust wrote, "Women pass in the street, different from those we used to see, because they are Renoirs." Known for his sun-dappled scenes of carefree leisure in bohemian Paris, French Impressionist superstar Pierre-Auguste Renoir is frequently referred to as "the painter of happiness." Interestingly enough, things weren't always so happy for the artist. Before enjoying the fame and success with which we associate him today, Renoir's career had a bit of a rocky start, because of political tensions in France during the 1860s and 70s. As a result, the first two decades of his artistic production have been sadly overlooked. This long-overdue publication is the first to examine Renoir's early years, with stunning full-color reproductions, academic essays, archival photographs and a chronology of the artist's life. FORMAT: Hbk, 9.5 x 11.25 in. / 302 pgs / 107 color.